How Hot Does a Plasma Cutter Actually Get? Plasma cutters can efficiently cut materials, whether they’re thin or thick. A handheld torch can sever steel plate up to two inches in thickness. Bigger torches which are controlled by a computer can cut steel up to six inches thick. Using plasma cutters is recommended when you want to cut metals in an angled or in a curved shape. Plasma cutting uses high frequency, high voltage spark that ionizes the air through the torch head to make an arc. This method is usually used in automotive repair, scraping operations, fabrication shops, and industrial construction. A Plasma cutter needs to generate concentrated, extremely hot plasma to cut faster and accurately. It’ll produce less distortion as well. Compared to an oxyacetylene flame which is around 6,000 degrees Fahrenheit, a plasma arc can reach 45,000 degrees Fahrenheit. This makes plasma cutters dangerous to use. There is a great risk of being electrocuted because more voltage exists at the torch. That is why when using one, you should wear a full face mask, proper eye protection, an apron, leather gloves, and a jacket. Wearing the recommended attire will prevent you from getting burns, eye damage, and other injuries. Remember to use only the correct voltage for the metal you’re about to cut. Aluminum requires less heat than steel. Other thicker metals require more heat as well. 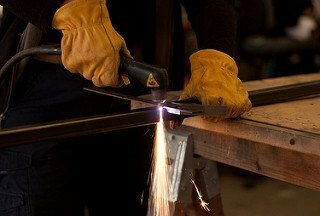 When cutting rusty metal like sheet metal, you’ll need to add a little more voltage to help you go through the rust. Also, maintain your plasma cutter properly by checking each part. For instance, the cover of the machine should be removed in order to brush off dust and dirt. Do this maintenance step every six months. It should be detached from the power supply after each use. You already know how hot it can get, so be careful. You will need to examine the electrode and cutting tip regularly as well. these two wear out and when they aren’t replaced at the right time, you won’t be able to cut properly, your travel speed will drop, and your torch head might get damaged.